Working in a small space isn’t always about organizing smartly. 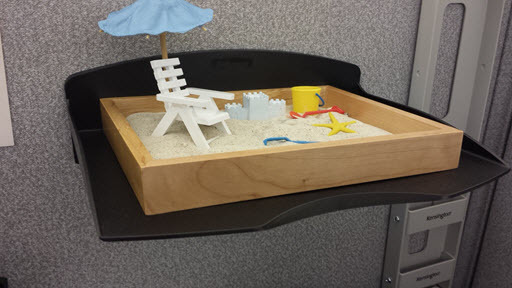 Sometimes you just have to add some levity to a small working space so that you can make it through each day with your sanity intact! I recently came across and purchased a really unique and well-made product called the Executive Sandbox – A Day at the Beach by the Be Good Company. 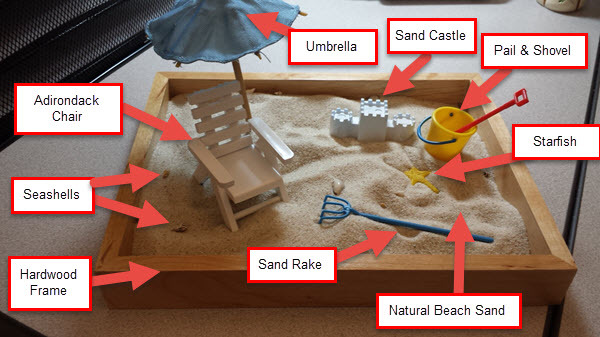 It is basically a sturdy hardwood sandbox of the dimensions 2.7 x 7.8 x 9.9 inches and comes complete with real beach sand, authentic sea shells, white Adirondack chair, umbrella and base, and some plastic toys to go into the sandbox. 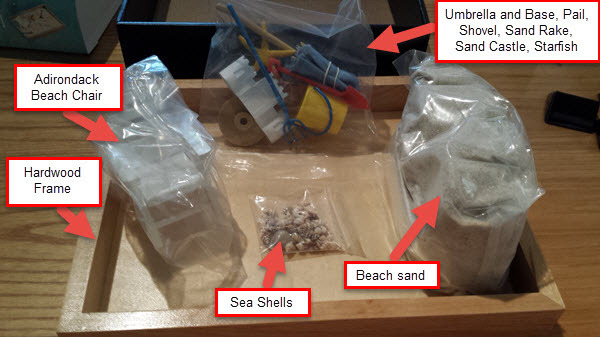 All of the contents can be seen below individually packaged and out of the packages and all set up in my office. I put together a YouTube video of the Executive Sandbox – A Day at the Beach from when I received it in the mail to actually adorning it onto my cubicle wall at work. If you want to learn more about the contents the YouTube video leaves nothing out. Here it is sitting on my letter tray hanging on my cubicle wall above my desk! 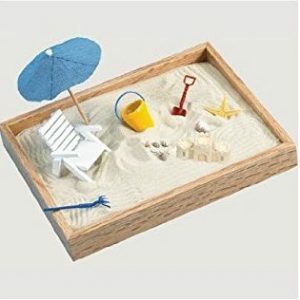 If you want to add a really neat and unique conversation piece to your office real estate this Executive Sandbox – A Day at the Beach would be a welcome addition to your cubicle or office. I'm enjoying mine and you can see it here hanging on my cubicle wall on my letter tray that you can read about here. 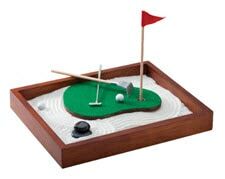 I've seen some pretty poorly-made office toys in my day but this one is of very high quality. 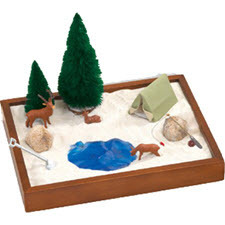 I was shocked at the fact that the sandbox is made from hardwood and not pine or some other soft wood. Once again if you have any questions at all about this product or others please leave them in the comments or use my Contact Me page. If you have any interest in this product here are some similar options below.